Artists can apply to the category of their preference, now through May 1, 2019. An application fee of $40.00 is required for the JURIED ARTISTS. In the juried category, there will be cash prizes awarded for the artistic quality of the artist's displayed work. Jury decisions will be finalized by May 1, 2019. If you are applying for the GREEN MARKET, please use the code Green19 to waive the jury/application fee. Where: The Bay Harbor Arts Festival will be located down Main Street and on the lawns in front of the Bay Harbor Lake Marina which is at the end of Main Street in the Village at Bay Harbor. 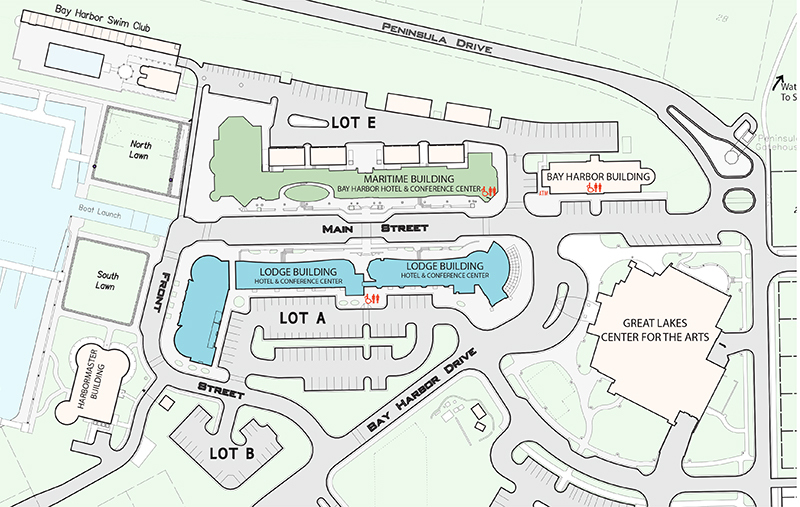 The Village at Bay Harbor is located right off US-31. Make phone payments by calling Anne with Bay Harbor Company Accounting at 231.439.2539 from 9:00 am - 5:00 pm weekdays. If you have questions email us at artsfestival@bayharbor.com and we will respond as soon as possible. The Bay Harbor Arts Festival encourages the creation of high-quality art that demonstrates creativity, innovation, and appreciation of the Visual Arts. We choose artists and artistic persons to participate in the show. The Arts Festival Committee, in turn, supports and enforces the acceptance and denial of participants. The Committee recognizes that the Arts Festival supports both professional and non-professional artist and seeks the opportunity to display a broad array of art. We also recognize that an Arts Festival creates an opportunity for artists and artisans to merchandise their talent through events and encourage the jury to be aware of these opportunities. We strive to provide a variety of artistic media to the public and patrons in an effort to make the Arts Festival both a high-quality art experience and a broad exposure to art. The Arts Festival Committee also recognizes and celebrates the talents and creativity of those who create one-of-a-kind high-quality food and similar items. Our festival contains a non-juried “Green Market” component intended for Artisan Items; soaps, lotions, items produced with commercially available beads, essential oils, and similar items. This is a rain or shine event – there will be no make-up dates or refunds. Booth spaces are 10ft x10ft, with a minimal footage available for storage. Vendors are not allowed to take up more than the 10x10 space allotted. Please stay within your footprint. Up to two (2) artists may apply to share a 10’x10’ booth- Application must include information for BOTH exhibitors. Vendors must check-in during the hours of 12:00 pm and 5:00 pm on Thursday, July 25 or have prior arrangements with event coordinators to check-in between 8:00 am and 10:00 am on Friday, July 26, otherwise they will lose vendor space without refund. Vendors must bring enough stock for the entire show and booth must remain open and attended for the duration of the show. Vendors cannot sublease assigned booths or employ sales agents or representatives in lieu of checking in and attending the festival. Vendors are responsible for collecting, reporting and paying all sales taxes collected to the appropriate revenue division. Vendors must furnish their own tent, table(s), chairs, extension cords, tent weights, lighting, (energy efficient bulbs) etc. Tents must be securely anchored to withstand waterfront high winds and other inclement weather. Heavy weighting with independent devices is mandatory. For the safety of all, vendors without adequate weights will not be allowed to stay at the festival. Tents must be covered and secured. The Village at Bay Harbor will not be held responsible for any products/merchandise/inventory/personal damage due to weather. Tents must be removed immediately after the close of the festival. Nominal security will be provided after hours. The Bay Harbor Arts Festival will not be responsible in any way for loss or damage to participant’s property. Each exhibitor is responsible for securing their booth each night. Exhibitors are responsible for their own personal property and liability insurance. Exhibitors are responsible for keeping their assigned area clean and orderly. If you leave leftover trash, boxes, or pieces of your exhibit you will not be allowed to attend next year’s festival. Active solicitation outside booth is strictly prohibited. Take-down will begin at 6:00 pm on Saturday, July 27 and no sooner! Vendors who break down their booth or depart prematurely on any day of the festival will not be allowed to resume business on the following day or at all at the festival the following year. All items must be picked up upon leaving the festival, especially jewelry fastenings, metal claps, wire, and string/filament. This is for the booth space only – Artist must supply their tent, tables, linens, chairs and other items necessary for a successful exhibit. The artist is responsible for the design and execution of his or her artwork according to the Bay Harbor Arts Festival’s Standards. The artist has read, understands and will abide by the Bay Harbor Arts Festivals’ Rules (see next page). The artist understands that the Bay Harbor Arts Festival, Bay Harbor Company et al., are not liable for loss or damage to artwork or personal injury. The artist understands and agrees that the Bay Harbor Arts Festival may use images of their artwork in advertising and promotion. Exhibition Standards: The Bay Harbor Arts Festival encourages the creation of high-quality art that demonstrates creativity, innovation, and appreciation of the Visual Arts. We choose artists and artistic persons to participate in the show. The Arts Festival Committee, in turn, supports and enforces the acceptance and denial of participants. The Committee recognizes that the Arts Festival supports both professional and non-professional artist and seeks opportunity to display a broad array of art and creativity. We also recognize that an Arts Festival creates an opportunity for your or emerging artists and craftsmen to merchandise their talent through events and encourage the jury to be aware of these opportunities. We strive to provide a variety of artistic media and green market items to the public and patrons, in an effort to make the Arts Festival both a high-quality art experience and a broad exposure to art. This is a juried arts festival, however this year you may apply to the Green Market Artisan section of the festival. This category is suitable for crafts, food, lotions, and other similar items and will not be juried. Bay Harbor Company reserves the right to deny any applicant that we feel does not meet the requirements listed below, follow the outlined rules below or for any other reason. This event is sponsored by the Village at Bay Harbor. Items sold MUST be original work by the exhibitor. Manufactured/kit jewelry/commercially produced products are PROHIBITED. Resale of wholesale items or internationally imported items (including buy/sell) IS NOT permitted in the Arts area and will result in immediate dismissal without refund. Offset printed reproductions of original works of art are permitted when labeled as such. Only products described in the original approved application will be allowed. All displays should be designed and constructed safely and in good taste. The Bay Harbor Arts Festival reserves the right to remove works or displays considered objectionable to the public or inappropriate for a family event and may do so without refund to the exhibitor. The Bay Harbor Art Festival committee reserves the right to reject any work or item it considers unsuitable, or that was not juried. The committee also reserves the right to interpret these rules. A refund may be given only after approved reasons and/or the booth space has been refilled. There will be an Administration Fee of $75 assessed from approved refunds. This assessment will be deducted from the booth space refund payment. At its sole discretion, the event reserves the right to waive the fee for good cause shown.